After purchasing our larger home in Oklahoma the first thing I needed to do was build a garage storage closet to store all of our tools. Every tool I had in El Paso, was still stored in boxes. Every time I needed a specific tool, I had to dig through a pile of boxes to find it. A 5 minute task would turn into 2 hours of searching. I needed to get all of my tools out of the boxes and organized ASAP. A pet peeve of mine is the absence of any storage space in garages. Reality check. Most garages, now days, are used to store an excess of stuff, junk, seasonal items, etc. Only a small percentage of home owners actually use their garages to park a working vehicle. Don't believe me? Step outside your house and look at your neighbors' houses. Of note: My husband and I are the only homeowners that park our SUV's in our garages at both houses in Oklahoma. Every single close neighbor does not. So why does one rarely find a home that already has built in storage closets or shelves in a garage??? High end homes will usually have storage areas. Think the Vanilla Ice Project homes. Ordinary homes? Forget about it. You can buy a bunch of ticky tacky shelves, which is what most folks do. I prefer a closet where you can hide all of the stuff from view. Unlike the El Paso house garage, which had no fancy doors or moulding, the Oklahoma garage has moulding, doors, and door knobs that match the interior of the house. So when I designed this closet, I needed to match the existing decor so the closet "appears" as if it was built when the rest of the house was built. Recessed area of garage where closet will be built. Moulding on wall along floor was removed and will be used later on outside of closet. Note walnut stained moulding around door openings and arched paneled doors. These design elements will be used on the closet exterior. The first thing I needed to do was select the area of the garage to build a closet. The wall between the garage and the house was the obvious place. This area was also recessed which would help in framing the closet. To get accurate measurements I first had to remove the moulding along the wall at the floor. The removed moulding will be used on the outside of the closet. The length of the recessed area was 163.5". The next decision was deciding how deep to make the closet. 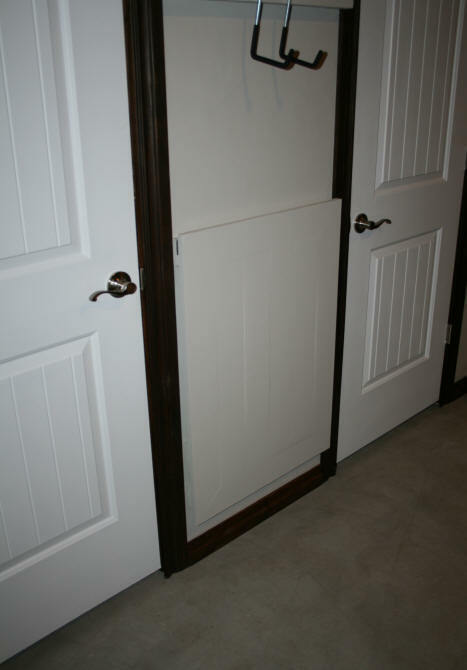 The obvious choice would be to make the closet as deep as the water heater closet which is 34". However, this is a 3 car garage. The 2 car side of the garage is large and we only have 2 SUV's. Even with the SUV's parked inside, there is ample room to walk. So I can make the closet deeper than 34" giving me more storage space. BUT.... there is a pull down stair for the attic access that cannot be blocked. The size I decided on would be 40"
The height of the ceiling is the garage is 9 feet. I could make the closet ceiling height. However, I always like large storage places for thin flat objects like scrap wood or moulding. So I decided to make the closet only 8 feet high with a foot of storage area on top of the closet. 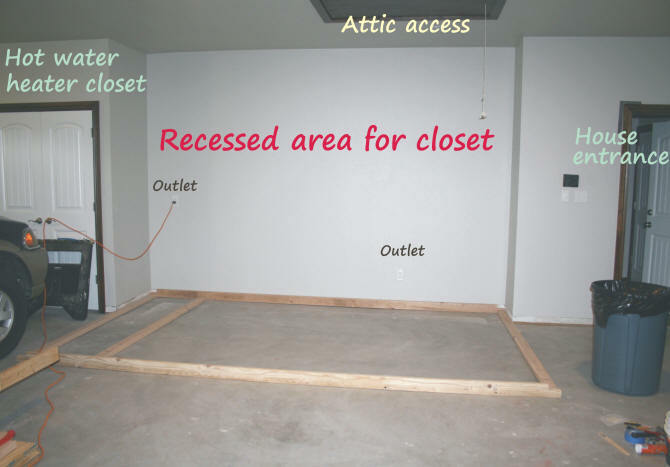 The image below shows the floor plan for the closet. There will be 2 large shelving places for large items. I section with smaller shelving and several areas for hanging items using rafter hooks. There will be two 28" doors for easy access into the closet. After drawing out my plans for the closet, I made an online purchase with Lowes. For this project I decided to make the purchase online paying $65 extra for the delivery. Why Lowes? For the area that we are in, in Oklahoma, Lowes was the only company that allowed online purchase with delivery. Home Depot, no delivery. For McCoy's, you need to make the purchase in person in the store. Since we live outside of the city where these stores are, Lowes was the only option for the purchase of the framing, doors, and plywood. Also, there is the time involved picking out the materials in the store. The Big Box store lumber can be less than desirable. Warped, twisted, too many knots in woods, etc. When selecting 2 x 4's or plywood, I spend hours going through the piles looking for wood that is decent enough for what I want. Also, a lot of time is spent loading my old SUV. I also cannot haul full sheets of plywood. With an online purchase, the store does all the picking and delivery. Yes, I take a chance of getting a crappy piece of wood, which I did. 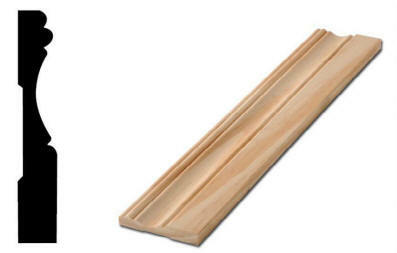 However, the twisted or warped 2 x 4's will be used for smaller pieces. Worth the $65 delivery charge not having to go to the store myself. I ordered the basic building materials and pre-hung doors (moulding and paint bought later) online on Friday, July 20, 2018. Delivery was the next morning on Saturday, July 21, 2018. Less than 24 hours from ordering to delivery. Can't beat that! The first section of the closet to build was the framing along the wall shared with the house. Since this framing was being butted up against an existing wall, the 2 x 4's were laid long edge against the wall. If this wall was a free standing wall, I would turn the 2 x 4's the other way. This way allows more room on the interior. Two of the 14 foot long 2 x 4's were cut to 163.5" and were used at the top and bottom of frame. Ten 8 foot 2 x 4's were first cut to 93" and then attached to the 163.5"- 2 x 4's. 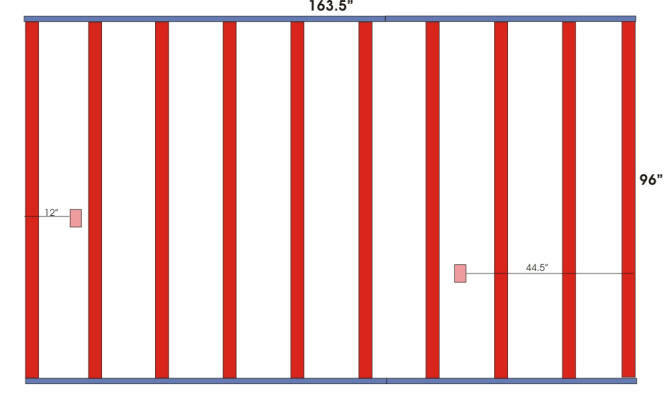 Spacing of the 2 x 4's is every 16" starting from the right side. I also needed to make sure that the 2 x 4's did not hit where the two existing power outlets are. The 3" scrap pieces of the 2 x 4's that were cut off were later used as shelf supports nailed to the frame. Back wall of closet framed and attached to existing studs in house wall. The back frame was nailed together with the 2-1/2 inch nails. Since nailing for me is difficult with the nerve damage in my hands, I pre-drilled the holes first and then nailed. In the corner of the back closet frame, I notched both corners. The side walls of the closet will be slid in here and then attached to the 2 x 4 on the back frame. Since this framing is supported by the existing walls, it is silly to waste a 2 x 4 in a corner that does not need the usual support of a freestanding structure. Corner notch made. Side of closet wall framing will slide in here and be attached to the 2 x 4 in corner. The next section was the wall on the left side against the water heater closet. The horizontal 2 x 4's were placed where the shelves will be placed. The horizontal 2 x 4's will be used to support the permanent shelves. Left wall of corner put in place. Horizontal 2 x 4's on this section will double as shelf supports. The next section completed was the front wall of closet on the left side. Horizontal 2 x 4's were placed at the same height as the side piece. This will provide the support for the shelves on the left side. Left front wall attached to the side. Horizontal 2 x 4's match side to additionally support the shelves. I then worked on the framing for the right side of the closet. The side framing has a large open space on the bottom section that will be used to store scaffolding platforms. Two scaffolding platforms will fit exactly into this space, held in place with a piece of wood slid into place. The front wall framing has a rafter hook hanging system. I just placed additional 2 x 4's on top of the horizontal 2 x 4's for the rafter hanging system. You just move the hangers where you need them to be. This rafter system can handle really heavy items, if needed. Right side and right front wall complete. Right front wall had rafter hook hanging system. Left and right side complete. Right and left corner fronts complete. Shelves for the left side cut and put in place until closet is painted. The shelves for the left side of the closet were cut and put temporarily in place. They will be removed when painted. The shelves also came in handy to store my tools while working on the closet. The support for the shelves on the right side were provided by using the 3" scraps cut from the back section's 2 x 4's. I just nailed the 3" scraps to the back frame. The next sections to complete was the center front and the door framing. These three sections were completed laying flat on the garage floor and were then lifted into place. The horizontal 2 x 4's on the center front section will support the 4 large shelves that will be in the middle of the closet. At the top of the door frame a 2 x 4 was added providing more hanging area for rafter hangers. Wall framing complete for the closet. From this point on, I did not take any photographs. I was so involved with just finishing this project while the temperatures outside were in the 90's and 100's. Hot , hot, hot. I needed to get all of the plywood off the floor of the garage so with my husbands help, the ceiling and walls were cut. The ceiling and wall were hammered into place. I then built the small shelf section on the left side. The large shelves were also cut for the center section. I made a run to the hardware store to purchase the moulding for the top of the closet, moulding for the inside and outside corners of , the doors, and the chalk board that will be painted on. The moulding was put in place and caulked. One week was spent painting everything three coats of paint. All of the bare wood got a coat of oil based primer. Why oil based and a primer for something inside????? Just extra protection in case anything DID get wet and because of the abuse a garage storage space will get. After the primer, the inside got two coats of a semi-gloss. Semi-gloss in case something spills. Easier to clean. The outside of the closet received 2 coats of the eggshell color that was used on the surrounding walls. Another half of a day was spent getting the two doors hung properly. After the doors were put up, the moulding for around the doorway was cut, stained, and put in place. The floor moulding removed from the back wall was cut to fit the outside closet walls and put in place. The two 2 x 8's were cut to provide additional rafter hook hanging along the right side of closet and on the front of the closet. Four coats of blackboard paint was painted directly on the small right wall. The moulding was cut, stained and glued onto the wall over the painted surface. Completed closet. Scrap lumber and moulding stored on top. 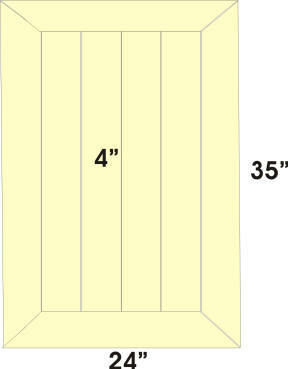 For the center wall of the closet, between the doors, I am debating whether to place a fold-up table there or not. 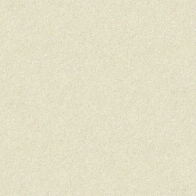 If I place a fold-up or fold-down table here, I will add the photos. The photo on the right shows the right corner of the closet. Where the closet wall extended beyond the existing wall, quarter round moulding was used in the inside corner. For the outside corners, I used PVC corner moulding which is cheaper than wood and a little tougher if dinged. At the top of the closet I placed moulding to hide where the plywood walls edges meet the plywood ceiling edges. This moulding was painted the same color as the wall. The chalkboard was made by first painting 4 coats of chalkboard paint. The moulding for the frame was cut and stained. I then glued the frame together on a flat surface. Since the chalkboard is on a single plywood surface I glued on the chalkboard frame instead of nailing it. I used a scrap piece of moulding and wood to make the chalk and eraser tray. It was mounted on top of the chalkboard to keep it out of the way. The photo to the right shows the small shelving inside the left side of the closet. Nine small shelves hold small objects like nails (using Crystal Light containers), tape, small tools, etc. To the left and right of the small shelves I nailed on short pieces of 2 x 4's to the back frame to create more rafter hanging space. Since I used pre-hung doors, the frame for the doors were the generic primer white. Around the door openings, I needed to stain the door stop area to match the moulding. This matches the style throughout the house and garage. 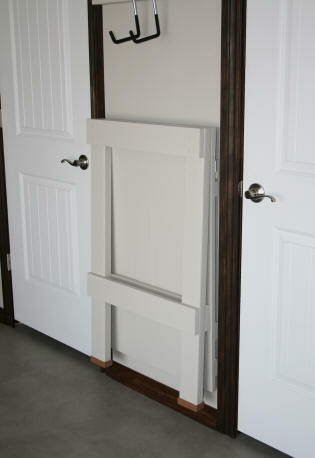 The doors also needed to be painted the same bright white to match the doors in the house. Photo to the right shows the right inside corner of closet. As I mentioned above, the right wall of the closet would be used to store some scaffolding platforms held in place with a board. The rafter hanging system on right front wall of closet is currently holding a ladder and some extension cords. If the closet looks packed you would be correct. I have my tools. My husband has his tools. Combined, there is a lot of duplication of tools. Oh well, we will work this out over time. This garage will also have a work bench and cupboards that will be built in the far right corner of the garage to the left of the water heater closet. When I build the work bench, I will add it to this web page. Same pattern as the moulding used on house but not as thick. I could not find exactly what the building contractor used. 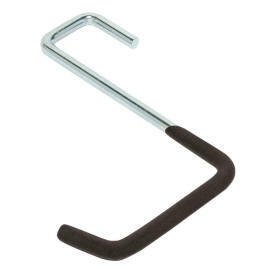 What am I talking about when I mention a rafter hanger system? It is simply a hanging storage system using rafter hangers. The cheapest and strongest rafter hangers I have found can be found at the Home Depot. The hangers are usually used in garages or storage sheds where the rafters are exposed. However, you can still use these hangers without exposed rafters by using 2 x 4's, 2 x 6's, 2 x 8's, etc. Just mount a 2 x 4 on a wall with as little as a 1/2 inch behind it so the rafter hanger hooks over the top. As your storage needs change, just move the hangers where you need them. One hanger holds 50 lbs. So 2 hangers can hold a 100lb object. 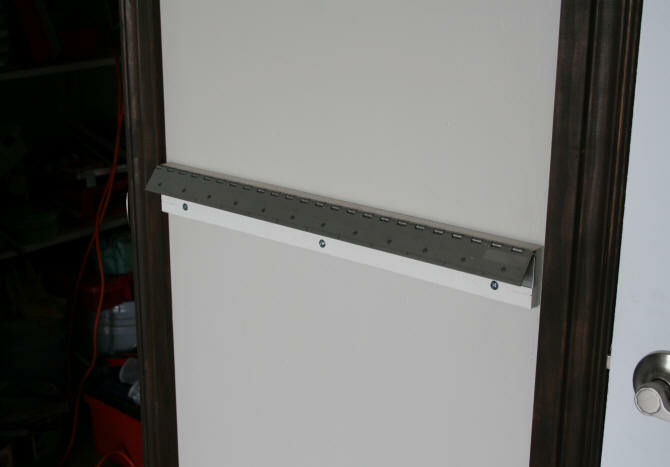 Just make sure your 2 x 4, 2 x 6, or 2 x 8 is mounted on studs in your wall and not just drywall. To create the space behind the wood, just attach a 1 x 4 on the wall on each end and some in the middle, if your wood is long, to the studs on your wall. Then attach your 2 x 4, 2 x 6, or 2 x 8 on top of the 1 x 4's. For the rafter hanging I created on the front of the closet walls, I did a little extra work. Instead of a 1 x 4, I used 2 scrap pieces of 2 x 4's cut 8" long. I then routed out a corner on each. Mounted the 2 x 4's on the wall and then placed my 2 x 8 in the notches. See diagram below and photograph. You can paint your rafter hanging system wood with decorative colors or don't paint it at all. If painted, it can look as fancy as those expensive less versatile metal hanging systems. 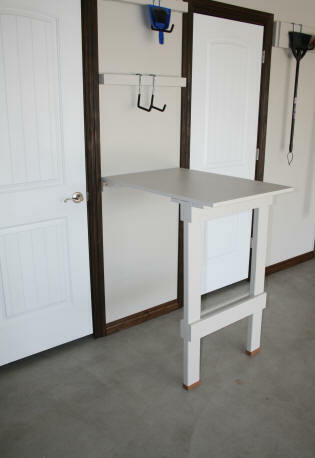 On the center wall of the garage closet I wanted to place a folding table. I always need a flat surface to work on or to set stuff on. Being older, with a bad back, I hate having to bend over all of the time. I wanted the table to lay flat against the wall when not in use. I also wanted it to fold down NOT up. I wanted to use the space above the table to place more hanging space. After searching on the internet for what other folding tables have been done, I soon realized that having a folding table WITH folding legs that folded down was going to be impossible for the small space I wanted for a table. If the table folded UP on the wall, there would be no problem. Because I wanted this table to fold DOWN, it would be impossible. It is hard to explain this, but with only 24 inches to place the table, the legs would not fit, if attached. I also wanted this table strong, so if you throw something that weighs 50+ lbs on it, it will not collapse. Therefore, the wall support needed to be attached to a stud within the closet. The stud height that will be used is 39.25" high from the floor. This is higher than a normal table height of say 30", but this was ok. I am tall and my husband is 6'2". The edge of the table will be resting on top of this wall support and not the hinge for support. 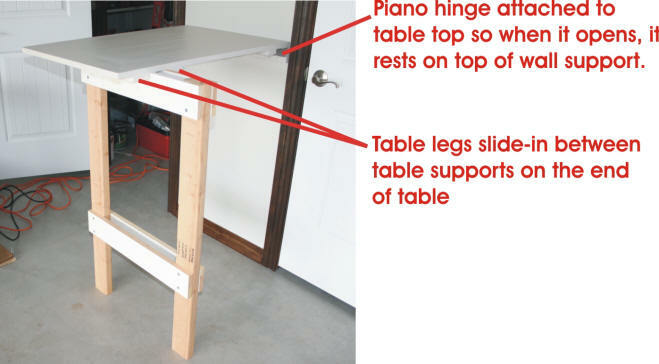 The table will fold down using a 24" piano hinge. The legs for the table will be made from 2 x 4's and rails of 1 x 4's. 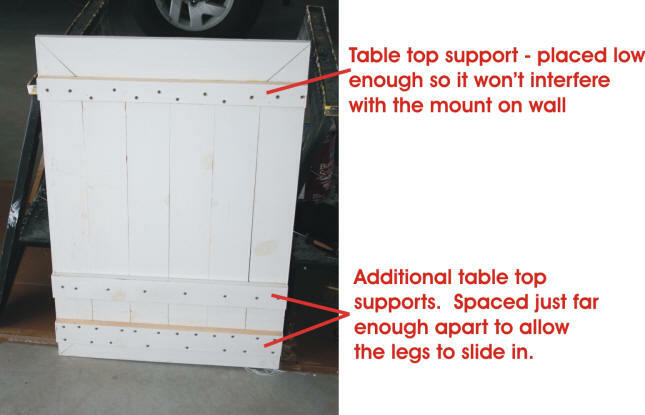 The legs that support the end of the table will slide under the table when the table is in use. The width of the table is 24" wide (width of wall) and 35" long (folding down). I could have made the table longer, up to 39", however, I did not want the table to hit the floor moulding along the wall. I could have taken a piece of plywood and cut it to 24" x 35". However, I did not have any 1" plywood on-hand, or a piece of project wood. Both would work just fine. You want something close to 3/4" - 1" thick for a decent table top. I did have several pieces of 1 x 12's that I used as shelving at the old house in El Paso that I dragged with me to Oklahoma. I did not toss them because it was good lumber!! I ripped this lumber into 4" wide pieces and put them together to make my table top. I used wood glue to hold it together. No nails. On the underside of the table I placed cross supports and screwed them into each piece of wood. The two cross supports at the end of the table where spaced just far enough apart to allow the table legs to slide in. The cross support near where the hinge would be was placed just low enough to prevent any interference with the hinge. 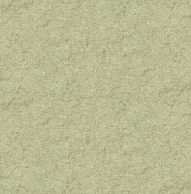 The table top was then given a good sanding, primed, and then painted the same color as the wall. The wood support for the hinge was screwed into the stud on the wall with 3 2-1/2" wood screws. The piano hinge was then attached to the wall support. The table top was fitted in place on top of the wall support and the end propped up so it was level. I then went underneath the table top and attached the piano hinge. Wall support screwed into wall and the stud on the other side. Piano hinge mounted onto support. I needed to wait until the table top was hung on the wall to make sure my legs were exactly the right height to make the table top level. I placed a level on top of the table top and measured the height for the legs. The 2 x 4 legs ended up being 40 1/8" inches long. Using my old ripped shelving wood, I made the rails for the legs. Attaching the wood on both sides of the 2 x 4's and screwing them in place with 2 1/2" wood screws. The legs were then primed and painted the color of the table top. Plastic 2 x 4 caps, purchased from a children's playground equipment website, were glued on the bottom of the legs. Believe it or not, no one else sells plastic end caps for 2 x 4's. There are metal caps for fencing, but no plastic ones for leg bottoms, unless you have a 3-D printer. Someone has online plans to make these. Will the legs come out from underneath the table? Of course, if you hit it hard enough. But you would really need to hit it hard. Normal abuse. Nope. The table only lifts a couple of inches up from the level position. This is because the wall edge of the table hits the wall and prevents the table from folding up. 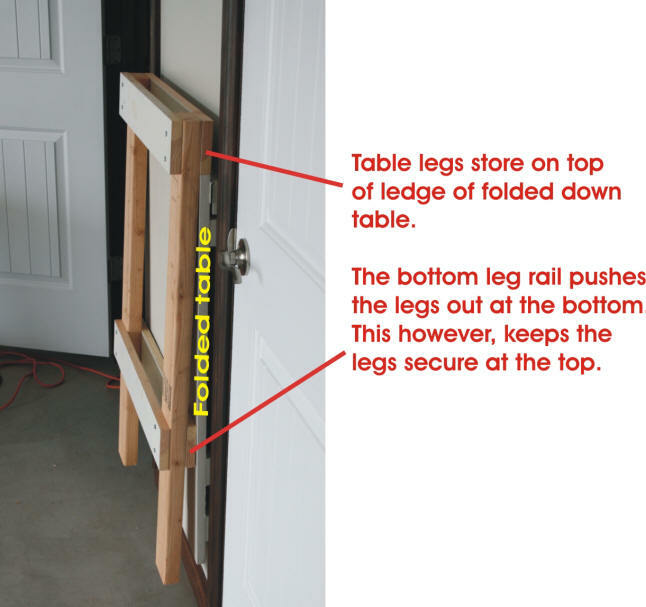 Will the legs stored on top of the table ledge fall off? Again, yes, if you hit it hard enough. I could also throw the legs up on the hooks above if needed. If any of the above become a problem, I will just make adjustments to secure the legs better.